After spending two months in Middleham, Yorkshire working at a racing yard, I could not leave England without making an interview with the person, who guided me on my first steps in the industry. Jason Ward currently has the best statistics in Middleham this year, which is a massive achievement in a place full of racehorses and trainers. RP: The horse racing industry is affected by your family since genetarions. You became a professional jockey at a very young age and started your own training buisness in 2011. Was it always the plan to follow your father’s footsteps or have you ever looked aside from racing? JW: No, it’s not a natural progression in the family. I rode professionally when my father was very old, so when I was looking to train my father wasn’t here anymore. So it wasn’t a natural progression. It was a want, I’ve always wanted to and like everybody I fell out love racing every now and then and tried different things, and the opportunity rose to train – and I grabbed it. RP: Before taking out your training license you travelled the world to work and learn. Who has the greatest impact to your current training methods? JW: I think you take a little bit of everywhere you go. But I was an assistant trainer for James Fanshawe for eight years and probably learnt the most there. James is very patient and probably he has the major influence but I’m very lucky I’ve worked for some big guns from all around the world and I think I take a little piece from everywhere. And it’s important to take a little piece. You have to be open minded. RP: Right now you share your home with 17 horses. The Manor House Stables can be called as a small yard. What would you say is the biggest advantage of running a small yard? How does that affect your horses? JW: Well no small trainer wants to be a small trainer. Every small trainer wants to have a hundred horses – and they don’t like to be called as a small trainer. I don’t. But the advantage of having a few, is it gives you more time with each horse. Probably in a big stable with 200 horses there’s a lot of them get messed psychologically and mentally, physically and probably this is why there is a market for a small trainer, because we do very well with limited ammunition. It’s just because we have a lot of time. It means individual feeding, individual training, individual everything. RP: And what is the biggest disadvantage? JW: Money, money, money. A lot of trainers in this country say as well, that we train to sell. We train to win and sell, purely. You know, there is a top 15-20% in this country and Ireland that control the Classics and the Group 1s, and it’s very difficult because they control and keep the bloodlines as well, so we’re dealing with the second division stallions straight away. It’s very proven in racing industry: you send the best to the best and you get the best, 9 times out of 10 you get the best – so it’s very difficult at this level. Running your business and selling your good ones, not keeping them – taking your horses as far as you can, then sell it. We buy a lot of horses, well bred horses, off the big trainers: 2 yo maybe 3, haven’t won, 6 figure babies – you win with them, and sell them on. 9 times out of 10 the reason we got them is because they were not good enough or there was something wrong, so not many go off and do better. RP: During your everyday, what makes the trainer’s job the hardest? JW: Staff, staff, staff. Training horses is easy, feeding horses is easy, but the racing industry in this country got too big without the workforce to follow it and from John Gosden to Jason Ward we struggle for staff. For good staff, who can give you feedback. RP: What is your most proud moment through your career/life? JW: Well my wife is having a baby so I’m quite proud of that – my first. But career wise it’s probably the little races where you worked very, very hard on a horse. It’s nice to win a big race, but most good horses can win a big race. It’s more satisfying to win a little race with an ordinary horse, which nobody else could win with. Shakour! Shakour came from John Gosdens’ ran there six times: his first run for me, he wins. Second run for me, he places in Listed race – that’s satisfying. That proves we’re just as good as anybody else. But we always had confidence. Our statistics are very very good for the ammunition and money we spent. RP: The 5 yo Maifalki debuted over hurdles this season with a nice 3rd place finish while also racing successfully on flat. How do you choose which horses could be suitable for hurdles and who can not change racing style? JW: Well Maifalki is a good example for your previous question. Because when he came to me, he was just and all weather course and no good on turf. So the first time for me, he wins on turf. Second time for me, he wins on turf. And then he’s placed in York. 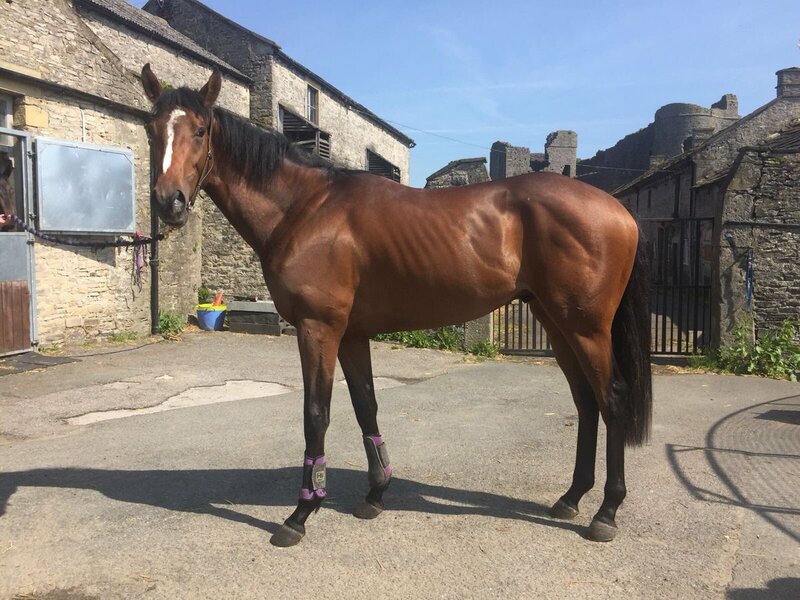 He’s a big horse and he stays 10 furlongs, 11 furlongs very well – so it’s a natural progression that with a big horse like him you would try to jump hurdles. But he’s actually flat bred, Falco. He’s French, but he’s not jumping-bred. And also he’s not really bred to go much further than 9 furlongs. But a horse his age, his shape his size and his distance says that he could possibly be a dual purpose horse, so he could do flat and jumps. So that’s just a natural progression really, which could have all gone wrong. He jumped great at home, I had no problems about his jumping, but you don’t really know whether it’s going to work or not. We got two or three here that could do it, and probably will. So we’ll see. RP: In the famous box which was occupied by the derby winner Dante back in the days, you now have a 2 yo colt by Canford Cliffs called Wee Jim. After expanding his distance to 7 furlongs he has already won two races. How is it different training and managing the career of a 2 yo with high and also unknown potential compared to the older ones? JW: The 2yos are growing. They grow from the minute you get them till they are 4-5-6. But as a 2 yo they grow and they grow and they grow, the front end grows and the back end doesn’t, and then the back grows. The best thing for a 2 yo is time. Whether they cost 800 pounds or 800 000. The more time you can give a baby, the better. Some horses are now bred to be 2 yos, and you expect them to be 2 yos. Wee Jim was always tall without any width. We were going hard at him in February-March, expecting to run but he grew, and he grew – so we backed off with his training and we let him grow. We’re probably reaping the benefits now of not racing him early – so the best thing he said to me was leave me alone, I need to grow. And he’s still growing and he still wants time. And I hope the owners will let me have more time with him. He’s a nice horse, Wee Jim, How good? We don’t know. But for what he’s doing and the way he’s doing it and how unfurnished physically he is – when he comes together you hope there will be more. If we push him, he won’t grow naturally – when you back off in training, they grow and they grow like mad. But if you keep push push push, it slows the growing process. Some trainers will tell you this, some would say I’m talking rubbish, but every time I backed off, they grew. That’s why Jim is now on no protein and doing very steady 2-3 furlong canters and we hope we’ll see the benefits. Jim eats everything and that makes it much easier, as he gets all his supplement and vitamins. RP: When was the last time you could get away from horses and go on a multiple days of vacation? JW: I’ll take weekends – we’re going to Goodwood for three days now for racing…and holiday. But Teresa and I, our last holiday was not last winter but the winter before when we went to Mauritius. We’ve always had one nice holiday, but because my business partner disappeared… But I have good staff again and I would be quite happy to go away for two weeks. Maybe no horses left when I get back, but I would go for two weeks – with Rebecca, with Stuart, with yourself, I would be quite happy to take time off. That’s why I’m going this week – right in the middle of the busiest, I’m going away for three days. RP: What is your biggest goal/dream as a trainer? JW: Obviously expand – build the business. We started with nothing, and in seven years we achieved an awful lot for a business that started with four yearlings that costed 4000 pounds. We were selling the horses for 40-50 thousand and paying 20-30 thousand for them. We are plenty of winners and we’ve probably outgrown our premises, which is a worry. So we just need to expand, we need to grow – build the business. Bigger and better, better horses, better investors, bigger staff, grow and grow. RP: Thank you Jason for the interview. In the name of the team of Racing Portal I wish you the best and even more success. JW: Thank you. It’s been a pleasure. Photo of Wee Jim belongs to @LamontRacing Twitter.